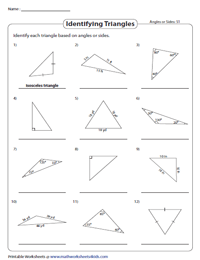 Here's introducing the concept of classifying triangles recommended for students of grade 4 and grade 5. 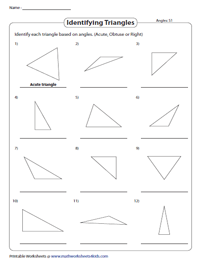 The worksheets are replete with practice exercises designed to give the child an advantage in identifying triangles based on sides and angles sorted into: with measures, no measures and congruent parts. 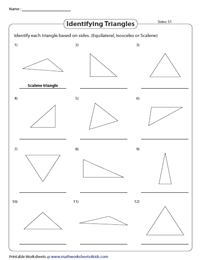 In these worksheets, learn to distinguish between various triangles based on the length of the sides, and tell whether the triangle provided with measures is an equilateral, scalene or isosceles triangle. 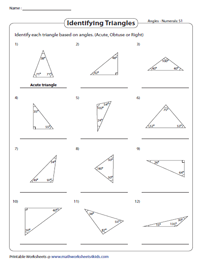 Level up your triangle awareness with this batch of worksheets provided with no measures. Classify them as isosceles, equilateral and scalene after careful scrutiny. Classify the triangles based on the congruent sides. An equilateral triangle has 3 congruent sides, an isosceles triangle has 2 congruent sides and triangles with unequal side lengths are scalene. For an acute triangle, all angles are <90°, a right triangle has one angle &equals;90° and an obtuse triangle has one angle >90°. Watch for the angle measure of a triangle in order to determine which is which. Beef up your practice with this bundle of worksheets represented with no measures. 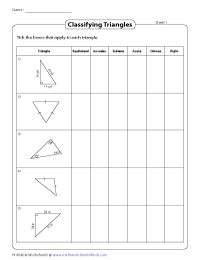 Use a protractor to evaluate the angle measure of each triangle to classify it as acute, obtuse and right triangle. 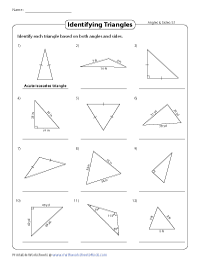 Each triangle in the worksheet is depicted with side measures, angle measures, no measure or congruent parts. Study each triangle and classify them accordingly. 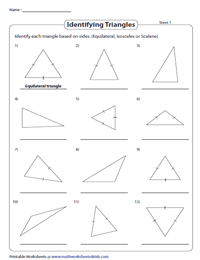 Classify each triangle based on sides and then classify further based on angles. Example, for a scalene triangle, classify it as scalene acute, scalene obtuse or scalene right based on angles. 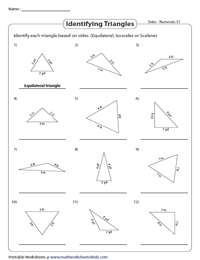 Consolidate your knowledge of classification of triangles with this worksheet. The six columns of the table are named as equilateral, isosceles, scalene, acute, obtuse and right. Examine the triangle given in each row and check the property boxes that best suit the triangle.